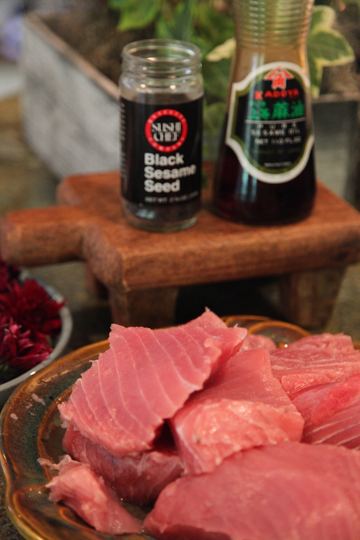 Here are two delicious ways to prepare fresh Yellowfin (Ahi) tuna~one simple, one gourmet! On a recent deep sea fishing trip, my hubs brought home a cooler full of fresh Yellowfin tuna. Since I had no idea what to do with it, I quickly took it to my friend and Family Savvy contributor Iris O’Brien and asked her to create a simple recipe using the tuna that I could share on Family Savvy. Not only did Iris create a simple Ahi tuna recipe, she also created a gourmet one for those with a more sophisticated palate. The BEST thing about her two recipes are that they share the same sauce. One sauce–two recipes. So, here is Iris’s wonderful and informative post on Ahi tuna. Enjoy!!! My “Family Savvy” friend Jamie called me today and asked if she could bring me a cooler full of freshly caught Yellowfin tuna. She said wouldn’t know what to do with it, and asked if I would like it for my family. My response to Jamie was, “Are you kidding me? Bring it on!” I assured Jamie that I would gladly take the fresh catch off her hands and “try” to find something to do with it! Yellowfin tuna was an unfamiliar fish to Jamie but not to me, as I grew up on and often “in” The Gulf Coast. Because of my upbringing, I have a great love for seafood and great experience in preparing it. 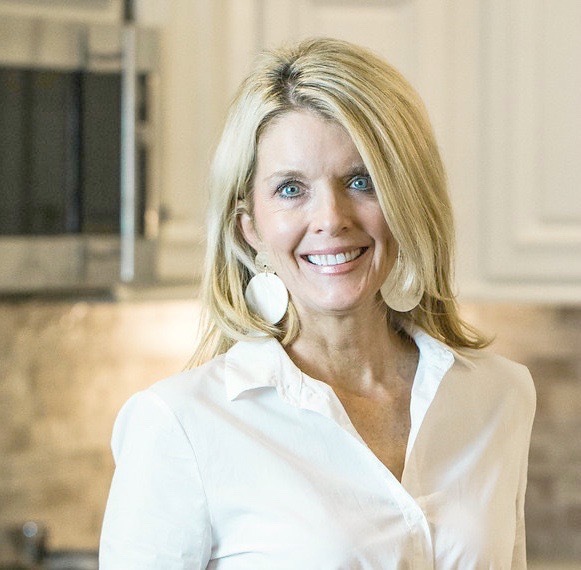 Jamie asked me to share my recipe with her so that she could share it on Family Savvy, so I decided to create an easy Yellowfin tuna recipe with broad appeal. I love helping friends like Jamie overcome their fear of ingredients they’ve never cooked with before. I also love showing them how tasty and nutritious new and exciting ingredients like fresh Yellowfin tuna can be. Yellowfin tuna and Ahi tuna are actually the same fish. If I were using this tuna for sushi, I would freeze the tuna overnight for sushi-grade tuna. For the Yellowfin that Jamie gave me, I chose two different directions. First, I created a fancier menu item that could hold its weight on any fine dining menu. Second, I devised a simple, family-friendly recipe. 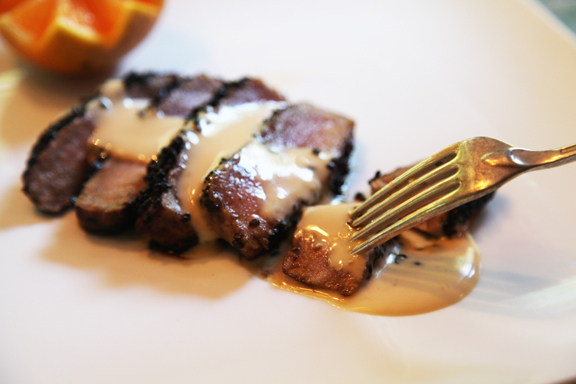 I decided to create a sauce that could pair with the tuna for both recipes, so I chose an Asian Citrus sauce similar to the familiar Japanese steakhouse salad dressing. My kids love this sauce! 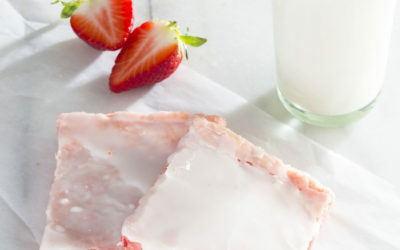 I have learned that if I can get my kids to eat these dishes, adults are sure to follow! So here are my two ways with Yellowfin tuna–one simple and one gourmet. The sauce is the same on both recipes; the tuna is just prepared differently. I hope that you and your family enjoy them! Combine sesame oil and next 6 ingredients in a blender;cover and process until smooth. Gradually add mayonnaise and process just until blended. 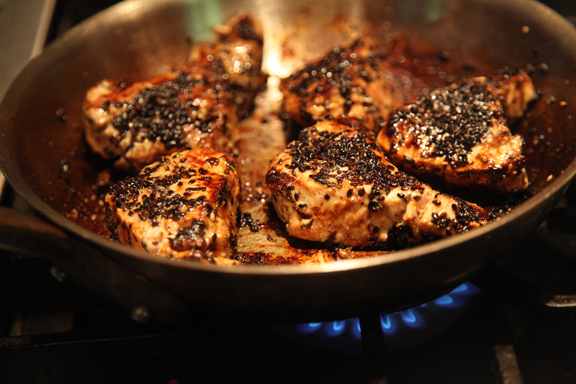 Season tuna steaks with salt and pepper. Coat each side with sesame seed. Heat oil in a large skillet over medium-high heat. Add tuna steaks and sear on each side until desired degree of doneness. Slice tuna on the bias (at an angle against the grain) and arrange slices carefully on individual serving plates. Drizzle with Asian Citrus Sauce. Serve immediately. 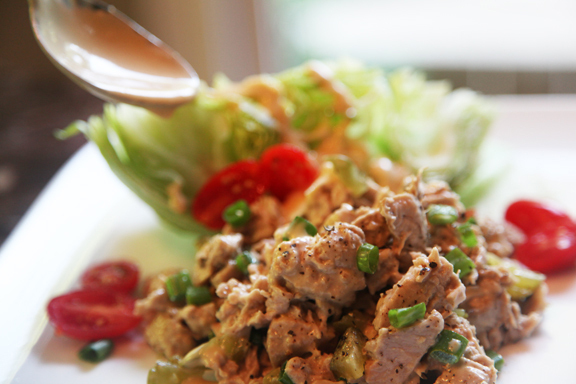 Another great idea for this tuna steak is to serve tuna steak or slices over a bed a spring lettuce mixture. Drizzle generously with Asian Citrus Sauce. Combine sesame oil and next 6 ingredients in a blender; cover and process until smooth. Gradually add mayonnaise and process just until blended. 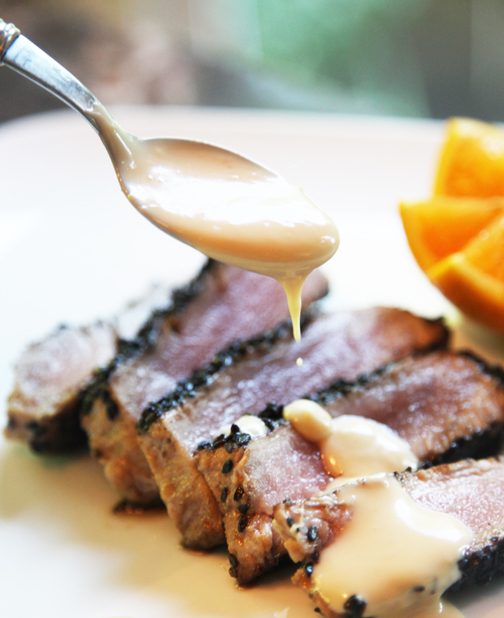 Season tuna steaks with salt and pepper. Drizzle with sesame oil. 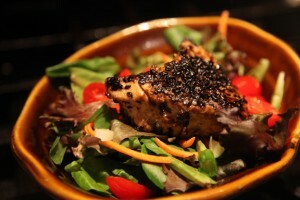 Grill or broil tuna 3 minutes on each side or until cooked through and fish flakes easily with a fork. Place tuna in a bowl; break into large chunks with a fork; cool. Add 1/3 cup Asian Citrus Sauce to tuna; fold in and green onions and pickles. Cut iceberg lettuce into 4 wedges. Place a wedge on 4 individual serving plates. Scoop 1/2 cup tuna salad mixture onto plate. drizzle wedge with remaining sauce and garnish with grape tomatoes. Mission accomplished! Two yummy and easy recipes that any family would love. Thanks again Jamie for the fresh catch! 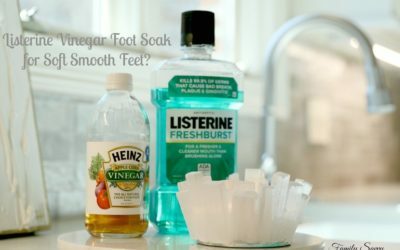 My family loved these recipes, I hope yours do too!